Products - ZT | Zippertubing Co.
Our wire and cable bundling product lines offer you the opportunity to add additional abrasion protection, chemical resistance, or insulation to your cable bundle. The wraparound products offer an easy install process that does not require disconnection of your cable assembly. Additionally, Zippertubing's products provide a closed system, which insures no dirt, debris, or other foreign objects will penetrate the cable bundle and damage the individual wires or cables within your harness. At Zippertubing® we offer a comprehensive range of cable management solutions including our wraps & covers which are treated to be resistant to water, mildew, weather, and abrasion. Our Z-Wrap can be configured with high tenacity weaves that are coated with various rubbers, polyurethanes, fiberglass or PVC's for use in a wide range of applications and industrial markets. Give a little more color to your cable management project with Snap-Grip® (Colors). The best in abrasion protection and closure strength. A lightweight, rugged, flame-retardant, wrap-around cable management system. Ideal for general cable management applications in office or industrial locations. Zippertubing's Snap jackets or sleeves are ideal for general cable management applications in office or industrial locations where multiple wires or cables penetrate cabinets, equipment housings or internal wiring of appliances. These products provide insulation, strain relief, and protection for a wide range of electrical wire or cables. Our heat shrink products are patented heat-shrinkable, wraparound solutions for on-site installation and repairs. You have the opportunity to add a wide variety of additional characteristics to a wire bundle, including water blocking, strain relief, EMI/RFI shielding, and chemical and thermal protection. PRT® Wraps are a unique solution to a common problem in the wire and cable interconnect industry. Our products ability to wrap, and then shrink when heated, provides an excellent means for creating a professional looking repair or secondary jacket to in service assemblies. By taking advantage of PRT&apos;s wrap around with side entry installation, we eliminate the need of time consuming disassembly and pull-thru installations while adding the option for break-outs where needed. Zippertubing® heat shrinkable shielding products will conform to the shape of wires, cables even components of various sizes and shapes with the ability to shrink down to a ratio providing effective EMI hardening of electrical interconnect areas and end terminals. Our heat shrinkable products are uniquely engineered with a dual wall system; the outer material is strong and flexible Polyolefin heatshrink tubing with an inner liner of finely knitted mesh or conductive foil each with frequency specific features that reduce radiated interference by reflection and/or absorption. Our heat protection products are not solely limited to tubular forms for cables and pipes alone; they can also be produced in custom shapes with different closure methods. The Zippertubing® Company offers a wide range of thermal management solutions that can be fully customized to suit your specific needs. Extend the survivability of sensitive components in a world of ever increasing temperatures. Zippertubing® is a leading manufacturer of thermal protection sleeves and jackets that provide a heat barrier designed to protect wiring, hoses, pipes or a variety of other components from radiant heat sources. We have the ability to produce custom shapes using a variety of heat reflective materials. A Thin, Highly Flexible Thermal Heat Barrier Pull-Through Jacket Sewn with a Stainless Steel Reinforced Kevlar Thread. A strong, high-temperature, fire-retardant, thermal-barrier pull-through sleeve to protect wires or cables that are exposed to extremely high temperatures. A thin, highly flexible, lightweight, high-temperature, thermal-barrier pull-through sleeve to protect wires or cables that are exposed to extreme temperatures. 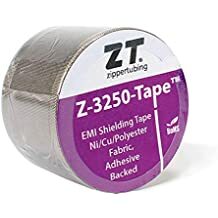 Zippertubing® is a leading manufacturer of thermal protection wraps and tapes that provide a heat barrier designed to protect wiring, hoses, pipes or a variety of other components from radiant heat sources. Our tapes and wraps have a reflective heat shield on one side and high-temp adhesive on the other to withstand radiant heat direct contact. With over 60 years of solid technical experience, Zippertubing® has the facilities and versatility to design, fabricate, manufacture, and supply a wide variety of EMI/RFI, lightning, EMP, and ESD shielded jackets or enclosures for military and commercial applications. We have a solution that will solve your interference problems quickly, accurately, and cost-effectively. 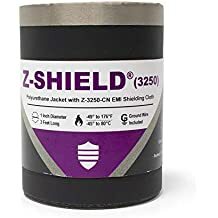 Zippertubing® offers a broad range of foil EMI shield products that can be combined with most of our jacket products and closures to create an EMI Shielding harness that provides outstanding performance and durability. Zippertubing® EMI shielding mesh materials are designed to yield excellent EMI shielding performance. Knitted into various sizes and configurations, mesh can be added to most Zippertubing® jacket materials to create an easy-to-install Zip-on EMI shielded assembly. Our knitted mesh design creates a highly flexible shield that unlike many tubular braids will not change attenuation performance when articulated. Because normal water movement and turbulence creates noise and vibrations which can distort or destroy signals from instruments, similar to interference caused by EMI/RFI, Zippertubing® has developed its Marine Fairings product line to greatly reduce these problems. Offering several different materials and closure methods Zippertubing® Fairing can improve hydrodynamic flow characteristics and reduce vibration and "strumming" because each independent, flexible fin is free to assume the most favorable flow orientation. Reduce the vibration, noise and drag created by water movement. Because normal water movement and turbulence creates noise and vibrations which can distort or destroy signals from instruments, similar to interference caused by EMI/RFI Zippertubing® has developed its Marine Fairings product line to greatly reduce these problems. Moored Cable Fairing are designed to significantly reduce the vibration, noise and drag created by water movement across the tether cable of a moored buoy. Because normal water movement and turbulence creates noise and vibrations which can distort or destroy signals from instruments, similar to interference caused by EMI/RFI Zippertubing® has developed its Marine Fairings product line to greatly reduce these problems. Our Towed Cable Fairing is designed to significantly reduce the vibration, acoustic noise and drag created by water movement across a towed marine cable.